See the States and Collect your Facts! 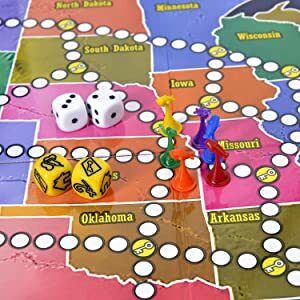 Take your unique airplane and travel the states, collecting information and cards that will let you win the game! Get your hands on the first edition of Keys to the Capitals before the next reprint! The perfect tool for homeschooling! 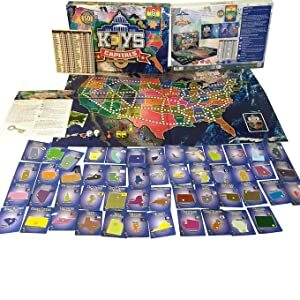 Keys to the Capital is a fun and engaging way for students of any age to learn more about the United States. 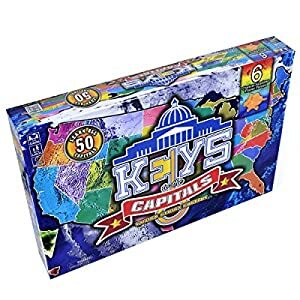 A portion of profit from every Keys to the Capitals sold goes to charities dedicated to increasing Autism and Asperger Syndrome awareness and research. Not only will you be receiving an amazing tool to bring families and children closer together and away from their tablets, but you'll be helping spread a better understanding of Autism across the country. We're learning our states and capitals and have been having an easier time learning the states than the capitals. This really helped us jump start the capital learning. It's not an amazing board game, but it is fun to play with the kids. The board is good quality and the cards are fine. I wish the dice were smaller, but they work fine. My kids are learning in a way they like and I got a refresher! I like it and suggest it. We really liked it! We donated one to a developmental disability agency, one to the local library and gave one to my sister's family! Great interactive game w lots to learn! Great communication with seller and my game arrived promptly! I played this game with a 9-year-old that I caretake after school and he stayed engaged the whole time. Your child won't learn the capitals after a single game, but definitely with repeated play and the games will go faster with more than two players. You could also use the Key Cards as flash cards. 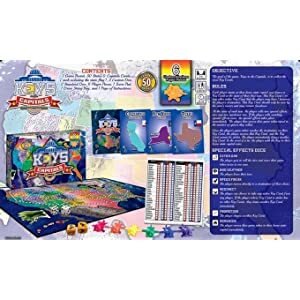 Overall a creative way to learn the map of the US and the state capitals!